Twelfth-century, German manuscript leaf which serves as a parchment cover for a near-complete 1566 printed text. View of open book with binding fragment visible, side 1. Written in Germany or Switzerland in the first half of the 12th century. 2-line probably 2-word, illegible inscription on upper cover. Used to cover a complete copy (ff. 62) of Boltz, Valentin. Illuminirbüch, künstlich. Frankfurt? : s. n.], 1566. 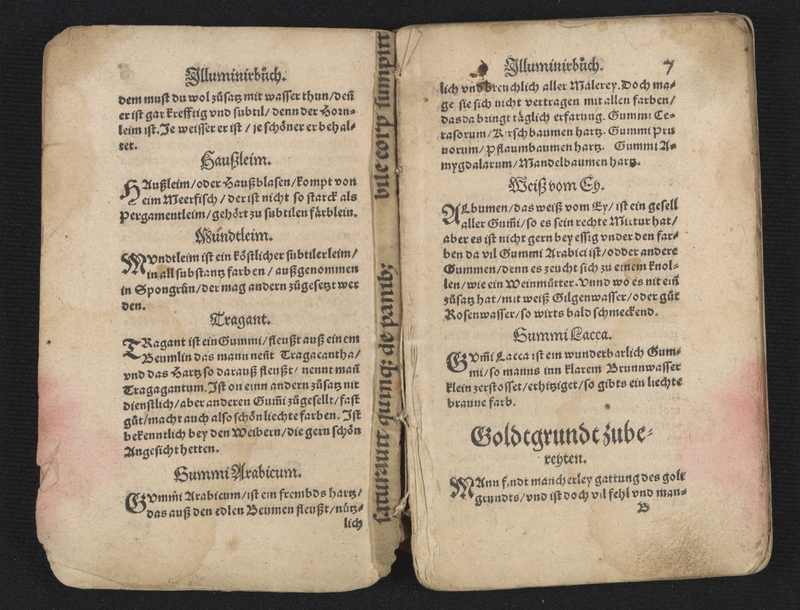 A guide to the preparation of dyes, pigments, inks etc., first published in 1549 (no records for 1549 editions and no records for original copies of 1566 edition exist on WorldCat). Two inscriptions at the bottom of f. 62v: one in contemporary script in ink, one in later script in lead, both illegible. Purchased by Special Collections, Waldo Library from the Mackus Company, Akron Ohio, July, 2009. Manuscript leaf was excised form a larger codex, cut in half and used to cover a 16th-century printed text; sewn on four stations with kettle stitches; spine exposed; each cover wraps around the first gathering. Single color, 1- to 2-line red pen-initials. Later inscriptions identifying the manuscript. Mone, Franz Joseph. Lateinische Hymnen des mittelalters. Vol. 1. Aalen: Scientia, 1964. Boltz, Valentin. Illuminirbüch, künstlich alle Farben zumachen vnnd bereyten Allen Schreibern, Brieffmalern, vund andern solcher Künsten liebhabern, ganz lüstig vund fruchtbar zuwissen, Sampt etlichen newen zugesetzen Kunstücklin, vormals im Truck nie ausgangen. Frankfurt? : s. n.], 1566.